“Stoker” is now playing at Sundance Cinemas; R, 1:47, three stars out of four. At first I thought that the projectionist at Sundance Cinemas had framed the image wrong. In the first few scenes of Park Chan-wook’s “Stoker,” Mia Wasikowska is repeatedly filmed so that there’s a few feet of empty space above her head. At first, I thought it was a framing problem, but when the adults in the film appeared, they’d be framed normally, their heads grazing the top of the frame. It ended up being one of many clever visual decisions by Park, the South Korean director behind “Oldboy” and “Lady Vengeance” making his English-language debut. 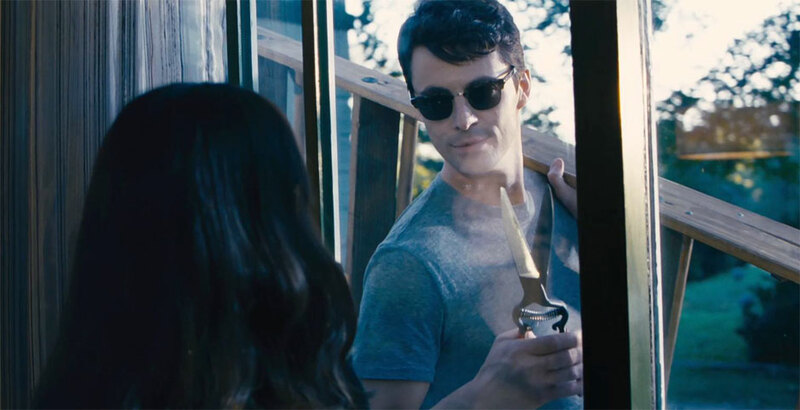 Other than a taste for twisted family relations and uneasy violence (and a plot point that feels like a direct homage to “Oldboy,” although to reveal it would spoil both movies), what connects “Stoker” to his earlier work is a determination not to waste any shot. Every frame of a film is a chance to say something, try something. I think that relentless attention to detail can be disorienting, even irritating for some audiences, and I was surprised to see “Stoker” getting low marks from some critics, who dismissed it as an exercise in amped-up style over substance. It’s true that in “Stoker” the story itself is basically a simple, eerie Hitchcockian thriller about a strange family in a strange house. But given that, the story is oft-told, wouldn’t you want the teller to find an imaginative way to tell it? Wasikowska plays India Stoker, a strange 18-year-old girl grieving the death of her father Richard (Dermot Mulroney) in a car accident. She was always much closer to her father than her boozy mother (Nicole Kidman), and with Richard gone, the two women circle each other in the old crumbling house uneasily. Adding to the tension is the appearance of Richard’s long-lost uncle, Charlie (Matthew Goode). Looking like the world’s spookiest Gap model, Charlie insinuates his way into the affections of India’s mother, but seems more interested in winning over the suspicious India. The trouble with an otherwise fine screenplay (by “Prison Break” actor Wentworth Miller) is that the audience is way ahead of the characters in these early scenes; we know Goode is up to no good, and it’s just a question of discovering what kind of no good he’s up to. But it’s only after “Stoker” is over that we realize how busy Park was in those seemingly inactive early scenes, setting up cryptic images (a water pistol in a briefcase, India making snow angels on her bedspread) that won’t pay off until later, and setting the film on a course that’s more unnerving and transgressive than we had perhaps been expecting. There’s violence, but the film is almost always better when the violence is shown off-screen or merely alluded to. More effective is the way Park will swing the camera back and forth between the characters, illustrating the changing power dynamics at work. Even a noticeably showy flourish, like strands of Kidman’s red hair dissolving into fields of wavy grass for a flashback, are effective. And the film is anchored by a nervy performance by Wasikowska; “Stoker” is as much anything India’s coming-of-age story, Charlie’s presence “stoking” the fires beneath her Wednesday Addams exterior. As the film goes on, India literally rises higher and higher in every frame, until the last scene in the film, when her face fills the screen, the camera that had been looking down at her now gazing up reverently. Good review. It’s a bit of a crazy movie, but that’s what makes it a bunch of fun, with an ounce of mystery in there for good measure.